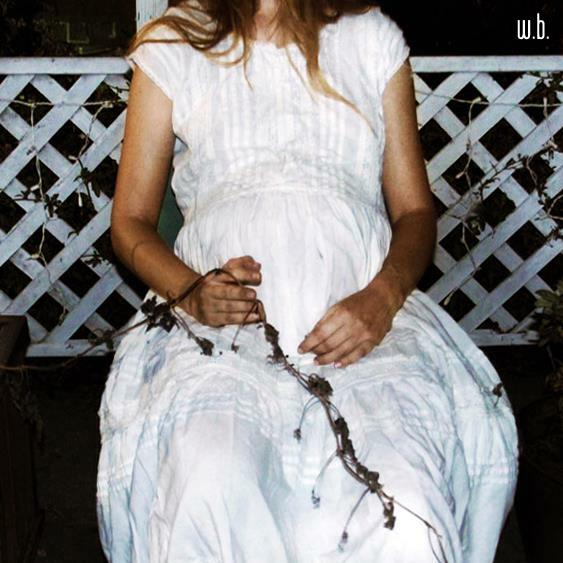 Bandcamp Track of the Day: Black Tambourine. I Wanna Be Your Boyfriend (Ramones cover). WTSH Classic Trax Archive: Slowdive. When The Sun Hits. it's only fitting that we take this time to honor our namesake. 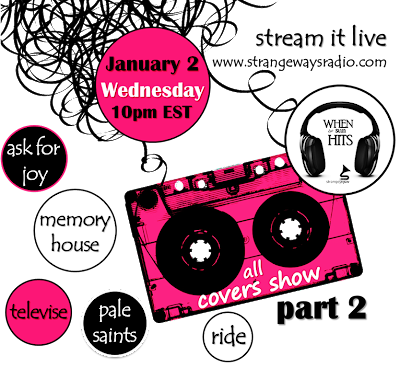 The All Covers Show Part 2 - this week on WTSH on Strangeways Radio. 10pm EST. 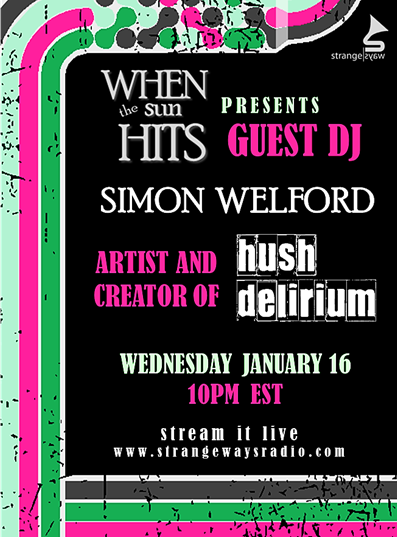 Early Notice: Simon Welford, Artist & Creator of the Hush Delirium Project, to Guest DJ WTSH on Strangeways Radio January 16th, 2013. 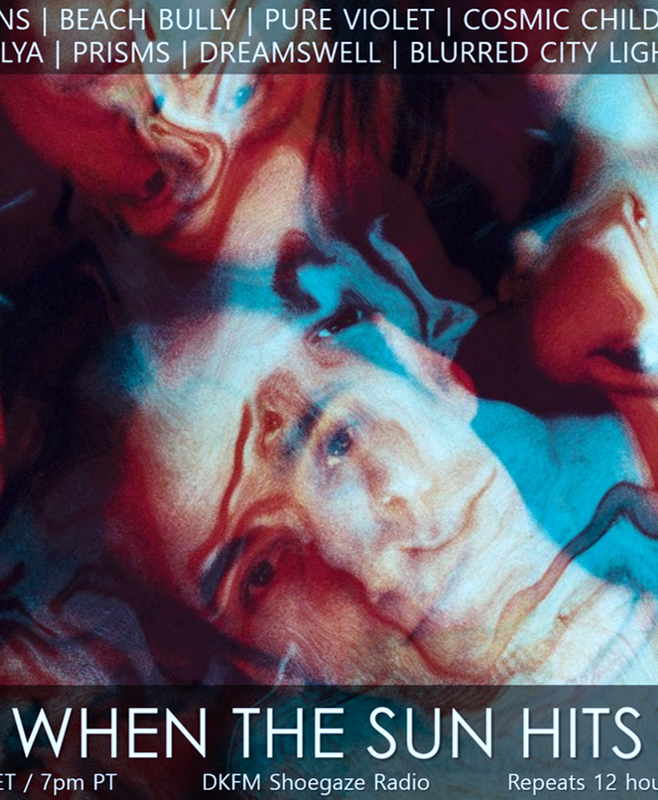 WTSH Classic Trax Archive: Cocteau Twins. Wax & Wane. 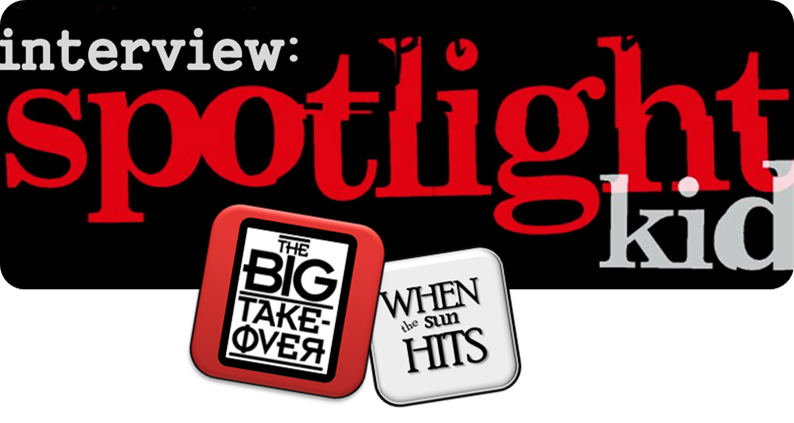 The Big Takeover Interview: Rob McCleary of Spotlight Kid. Nottingham’s Spotlight Kid is a modern shoegaze band with no less than three guitarists (Chris Moore, Karl Skivington, and Rob McCleary), real drums (Chris Davis), bass (Matt Holt), and the divine singer Katty Heath. Critics like to come up with all sorts of comparisons, and I am no different. I cut my teeth on 90s shoegaze, so of course I hear Ride, Lush, and even The Pale Saints. 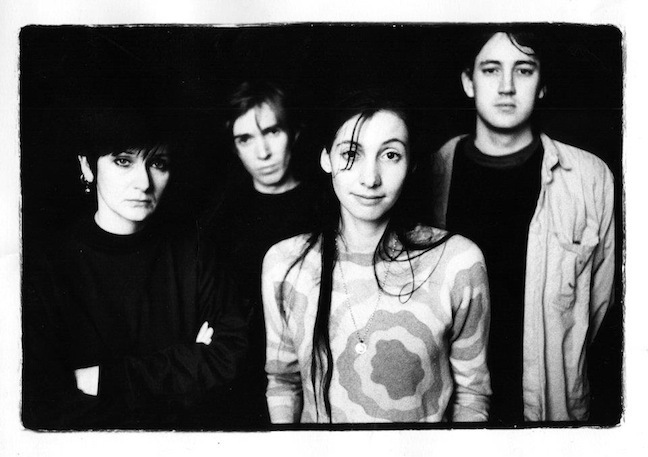 My Bloody Valentine is a given, but the band also grooves to modern acts as mentioned in the interview. They first caught my interest early last year thanks to my music friend John Norris, and their music unfolded like a beautiful flower on my dream pop playlist. I hope after reading this interview and listening to the video and audio clips I’ve included, you add them to your playlist as well. Thanks to Rob McCleary for agreeing to this interview. So you named your band after a Captain Beefheart album. How large a part does Captain Beefheart play in your sound, if at all? Because you just know every music writer is going to ask about this or mention it. ROB: Not much at all, we have a little bit of psychedelia in some of the track,s but it was never a major influence on us. Like you say, we get asked about it all the time, but it’s a great record and a great name for a band. Can you give us a capsule summary of how Spotlight Kid got started, from the ashes of Six by Seven to your current lineup? ROB: We met with Chris D (Six by Seven) when we went to see Six by Seven play in Madrid. He was looking for a full band for a project that he had been working on for a few years as a studio band, and we had just finished a record with our old band so we joined up. Matt joined about a year ago, and we have been the same ever since. How difficult is it to work together with members being geographically dispersed? ROB: It’s not as bad as you would think. We demo the songs in our studio, which we can use whenever we want. Matt (who lives in London) is back every other weekend, so we can get down and record. We tend to email Katty tracks, and she can add her vocal on. We don’t tend to write tracks all in one room so this works. I would like us to get some more tracks written as a full band for the new record. I hear Ride, MBV, Pale Saints, and even Lush tossed into the sonic mix. Do you have any particular favorites in the dream pop/shoegaze genre? ROB: Personally I love newer shoegaze such as Autolux, Beach House, Amusement Parks on Fire, M83, and A place to bury strangers. They are all great new bands that have inspired us a little. You’ve released music on a number of labels from Club AC30 to Saint Marie. Have all these label experiences been positive? ROB: Yeah definitely, they are all great to work with. We released the last record ourselves with the help of Tri-Tone who distributed it. We paid for all the PR and promo out of own pockets, so we know what it’s like to run a label. It’s tough. It’s early days with Saint Marie, but we just hope they can get our record out to people to hear it. Where do you have your greatest concentration of fans? And have you visited us Stateside yet? ROB: Obviously, we have more fans in England as that is where we have played the most. I’m not sure about how the Stateside following is. We do get a few orders and requests to play from the States. Our music would go down well over there, so we would love to get over at some point soon. Can you speak a bit about how you achieve your sound in terms of equipment and recording techniques? ROB: We keep it simple, recording live in a room at once. We have recently used a studio in Norwich which is a converted church. We set up the room and play together; usually we take about three goes, and then record the vocals separately. We don’t use that much equipment; I have a reverb pedal, a delay and a big muff. That’s it. Chris and Karl have a few more, but its mainly reverb and delay. What’s been your best experience touring in terms of bands you’ve toured with? ROB: We haven’t really toured with anyone to be honest, we tend to go out on our own. We are playing a couple of dates with Amusement Parks on Fire in February so we are looking forward to that. When we play with suppor,t they can be either really nice or real dicks. You usually find the new bands who are still playing to have some fun are the best to get on with. It still amazes us when a support band turns up with a plectrum and a tuner and expect us to provide a full backline. We tend to tell them to get back on the tube and sort themselves out! But didn’t you tour with Joy Formidable (big favorites here at Big Takeover)? I had read that somewhere, and wondered how that experience was. I really enjoy their music, and they seem like a cool group. 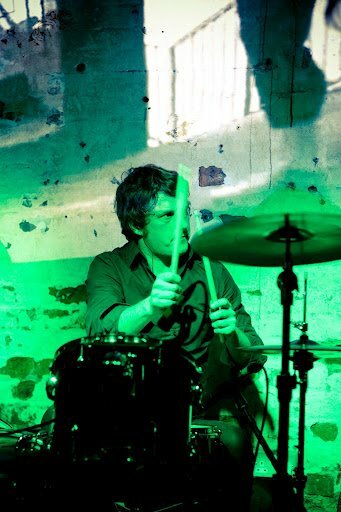 ROB: Yes we played some gigs with TJF, they were an amazing band! They really looked after us, and gave us a chance to play with them despite their booking agents wanting a band from their roster to tour with them. They heard about us through a fan, and they checked us out and offered us the dates. A really nice genuine band! 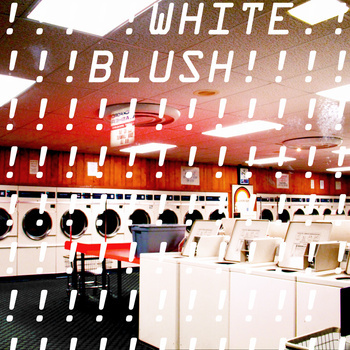 With everyone trying to label a certain sound, do you mind tagged as a shoegaze band? ROB: Not really, I don’t think anyone is bothered about a tag, It’s more about whether you sound good or not. I think the label helps when people are looking for a certain type of music and they come across us by accident. What does the band prefer to listen to when you’re not immersed in your own work? ROB: We all listen to loads of different stuff, but we don’t tend to listen together. Our tour bus doesn’t have a radio player so it’s a bit rubbish, we have to stick our headphones in. I’m listening to a lot of new UK bands and the usual dose of My Bloody Valentine of course. Out of your body of work, are there any favorite songs the band favors? ROB: We all enjoy “Haunting Me” live, it’s a great track to blast out. The new ones are coming together now so we are favouring those more as they are fresh and make you play a little harder. With Disaster Tourist just released on Saint Marie in a deluxe edition, do you have additional material in the works or will you focus on touring behind Disaster Tourist? ROB: Our new album should be ready by the summer. 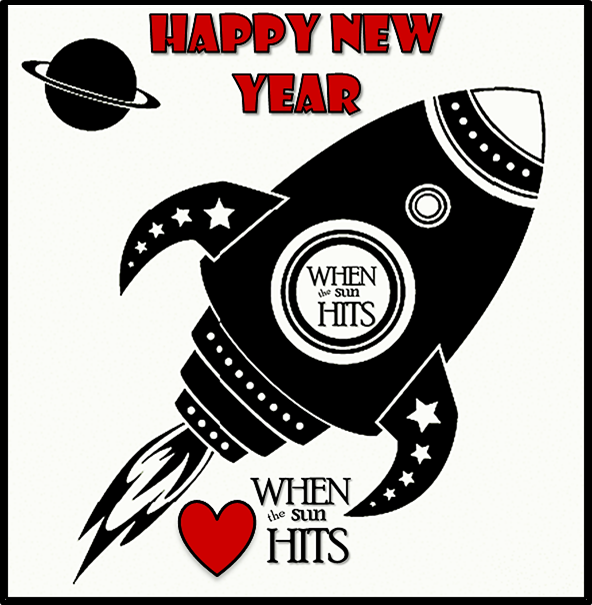 We have about 7 tracks that we think are there so we are going to record early in the new year. This is a preview of songs being worked on for Deepfieldview, the music of Danny Lackey with contributions from Anna Bouchard from Drowner, Eric Matthews and Nancy and Charlie from Her Vanished Grace. This is just a teaser for the upcoming release, which you'll be able to buy on Bandcamp, so that you can enjoy Danny's great music while helping with his recovery. Bandcamp Track of the Day: The Endless. Falling (instrumental). 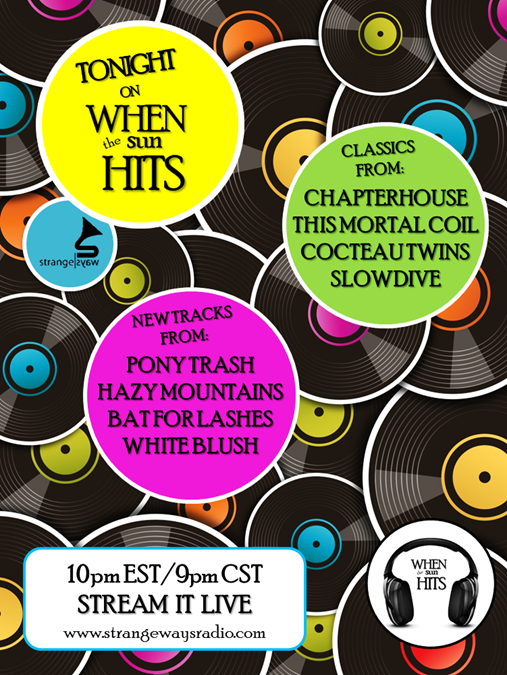 Set List for the All Covers Edition of WTSH on Strangeways Radio. Originally Aired December 26, 2012. 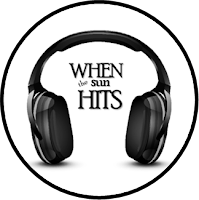 The All Covers edition of When The Sun Hits on Strangeways Radio was such a blast! With so many requests from listeners for a part deux, you can expect another Covers show in late January 2013. Sweet! This first Covers show will re-air Friday morning (December 28th), 10am EST on Strangeways Radio. Stream it live at www.strangewaysradio.com! Field Mouse. Falling (Twin Peaks Theme). Ride. Sight of You (Pale Saints cover). Brief Candles. Space Age Love Song (A Flock of Seagulls cover). My Bloody Valentine. Map Ref. 41 N 93 W (Wire cover). Spotlight Kid. Don't You Forget About Me (Simple Minds cover). Ulrich Schnauss. Love Forever (Chapterhouse cover). Her Vanished Grace. Across the Universe (Beatles cover). 2 Hearts & Chemicals. Teenage Angst (Placebo cover). Engineers. Hey You (Pink Floyd cover). The Jesus and Mary Chain. Vegetable Man (Syd Barrett cover). Shoegaze Cover: Televise. Mercy Seat (Ultra Vivid Scene cover). TONIGHT! 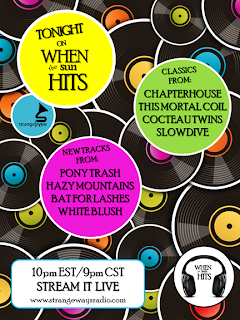 The All Covers Edition of WTSH on Strangeways Radio. 10pm EST. My Bloody Valentine announced recently on their Facebook page, "On 21-12-12 we finished mastering the new album!" So even if the world didn't end that day, something pretty momentous happened. We still don't have any release information about the full-length follow to MBV's 1991 shoegaze masterpiece, Loveless. As Kevin Shields recently told NME, the record will apparently be released via the MBV website, followed by an EP of new recordings next year. Shields said the new record "really frees us up, and in the bigger picture it's 100% necessary." "People who like us will immediately connect with something," he told NME. "Based on the very, very few people who've heard stuff-- some engineers, the band, and that's about it-- some people think it's stranger than Loveless. I don't." 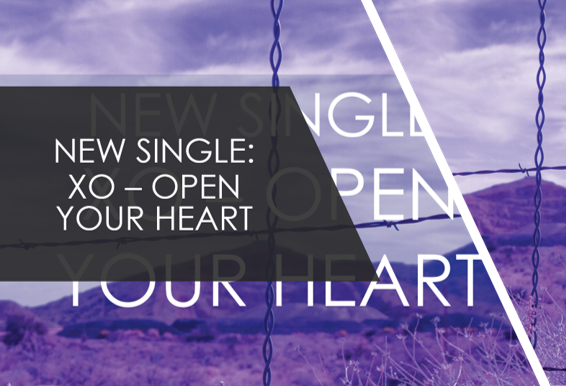 As bassist Debbie Googe told Drowned in Sound, Shields plays most of the music on the album himself. "Most of it is stuff Kevin has done, certainly guitar wise. It's been a long process, you know," she said. "The drums have been added then taken off at least once. His brother did them at one point, then Colm [O'Ciosoig] came in and redid them. There's some things Kevin can't do, like the drums or Bilinda [Butcher]'s vocals, but everything else he can, and I'm certainly happy for him to do that." "I'm just finishing a record that I had started in the 90s. It was going to be, like, the next record. But it was already after the band had half split up, and me and Bilinda [Butcher] were left. Then we got back together. I've always said that we were going to make a record again. You never know, we might finish it really quickly, and it might be up in a few months! I tend to work really quickly, suddenly, and I might be willing to do that right now. We'll see!" 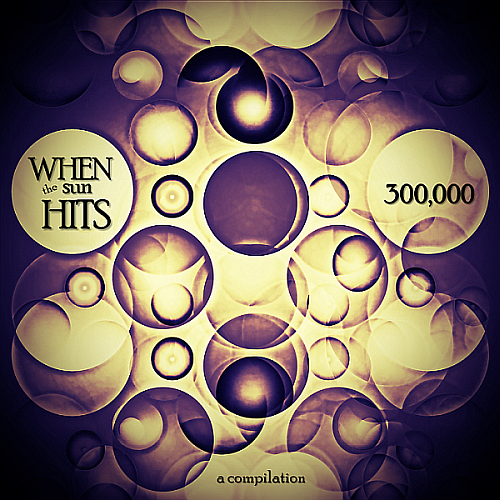 Compilation Sneak Peek: The Official Cover Art for the Upcoming Three Hundred Thousand Compilation. 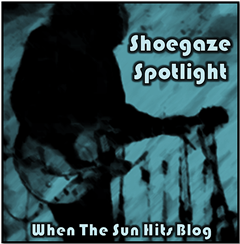 WTSH Shoegaze Spotlight on Strangeways Radio. This Week's Gaze: Belong. This week's focus is on the incomparable Belong. We at WTSH love Belong and after reading this, so will you. Shoegaze Quote of the Day: Peter Kember of Spacemen 3 discusses drugs, technology and genetic mutants. 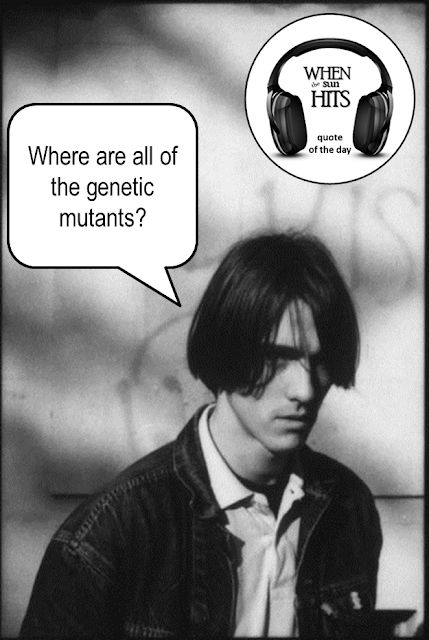 "Where are all the genetic mutants that acid was meant to cause? Governments have spent fortunes for years trying to prove that cannabis does you harm. It's the same old thing...I believe that whenever people are going through incredibly high-tech phases in society they eventually find that all the material gain is a mask for a very soul-less lifestyle, hence the need for alternative experiences and that's where the use of psychedelics comes in." Bandcamp Track of the Day: Nothing. The Rites of Love and Death. The Rites of Love and Death. This Week On When The Sun Hits: The Covers Show. 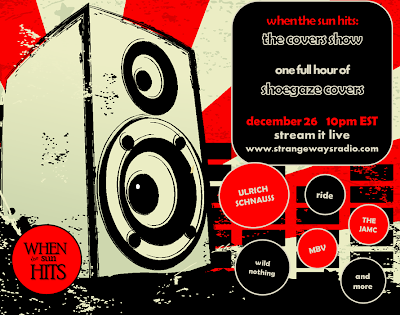 All Shoegaze Covers only on Strangeways Radio. Dec 26 10pm EST. Set List for WTSH on Strangeways Radio. Aired December 19th, 2012. The Chameleons. Silence, Sea and Sky. His Name is Alive. Love's a Fish Eye. Pony Trash. Dry Your Eyes. Asobi Seksu. Perfectly Crystal (Beach Fossils + Spirit Animal remix). Auction for Danny Lackey Fundraiser Ends Tomorrow! The second round of the Auction for Danny Lackey's fundraiser will run till December 20th, 2012. There are so many awesome, one of a kind items to bid on, and the proceeds all go toward a great cause - contributing to a health fund for Danny Lackey, co-creator of WTSH blog. "In 2010 Chapterhouse reformed for reunion tour. The Brooklyn show was at The Bell House with Dead Leaf Echo who designed the show poster and had a few rare copies signed by Chapterhouse. One of these copies is now up for auction to help Danny." Purple Bloom 1st album CD "Purple Bloom", with autograph including the winner's name. 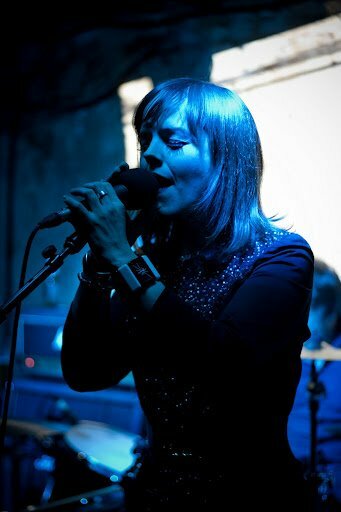 Her Vanished Grace MONITOR MIXES, rare 1996 Remix EP of HVG's version of the song Siouxsie & The Banshees "Monitor"
Jas of The Vandelles is donating a day in the studio (Brooklyn) + mixing!! "I live in Williamsburg Brooklyn. My studio can accommodate a full band recording up to sixteen channels and I use protools 10. The donation is for a day of recording whatever you want and ONE song recorded mixed and ready to go out for whatever you want to use it for. The general going rate for a day in a studio around here is $300..."
Jeff Ware has donated a Tears Run Rings 'Distance' test press #5/5 LP to the auction! Tom Lugo and Stellarscope has generously donated a Stellarscope package, containing 'This Is Who We Are' CD (signed), T-shirt, sticker and pin! 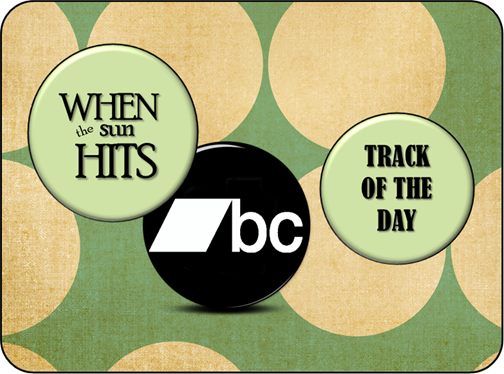 WTSH Classic Trax Archive: The Ecstasy of St. Theresa. Swoony. TONIGHT! WTSH on Strangeways Radio. Stream it live 9pm CST/10 pm EST. Bandcamp Track of the Day: Field Mouse. You Guys Are Gonna Wake Up My Mom. You Guys Are Gonna Wake Up My Mom. Bandcamp Track of the Day: Pony Trash. Inner Worlds. Classic Trax Archive: His Name Is Alive. Love's A Fish Eye. Bandcamp Track of the Day: Screen Vinyl Image. Roaming Spirit Freedom (2012 Remaster).